Naval Air Station Sigonella, located in Sicily, Italy, is the Navy's hub of operations in the Mediterranean Sea. The base supports the US 6th Fleet as well as 40 other units and 4,000 direct personnel. The air station serves as a major stopover point for US aircraft that are bound for Asia. 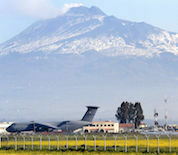 Aircraft from all branches of the US Armed Forces can be found at Sigonella including C-130s, C-17s, C-5 airlifters, C-9B Skytrain IIs and C-40A Clippers. The air terminal at NAS Sigonella provides an ideal gateway for Space A travelers to experience Italy and Europe. The base is situated near the Mediterranean sea and Mt. Etna. This NAS Sigonella directory features the critical info you’ll need to navigate through the many facilities and recreational opportunities available on base.